Hydrogen peroxide is a familiar chemical that is known for its many household uses. Medical professionals no longer recommend that this chemical be used for cleaning wounds, since it contributes to slower healing times and scarring. However, there are a lot of practical home tips and beauty hacks that are unknown to most people. 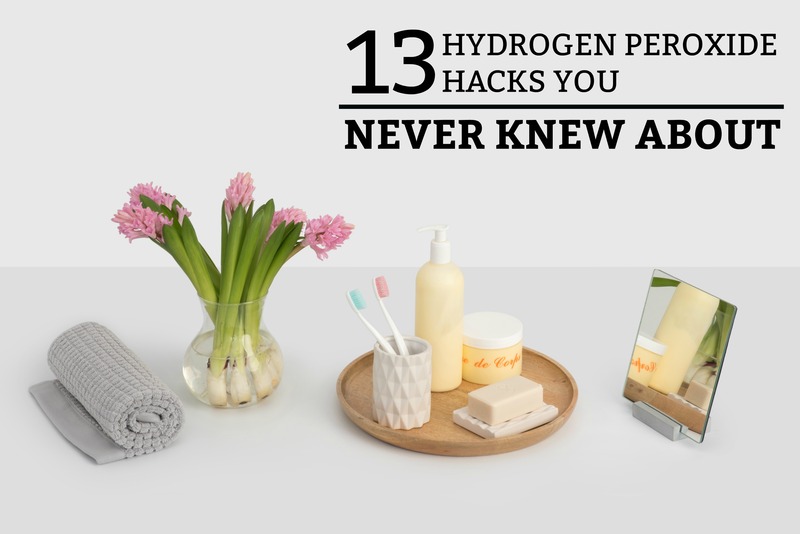 Below are 13 hydrogen peroxide hacks that you’ve never heard about before. 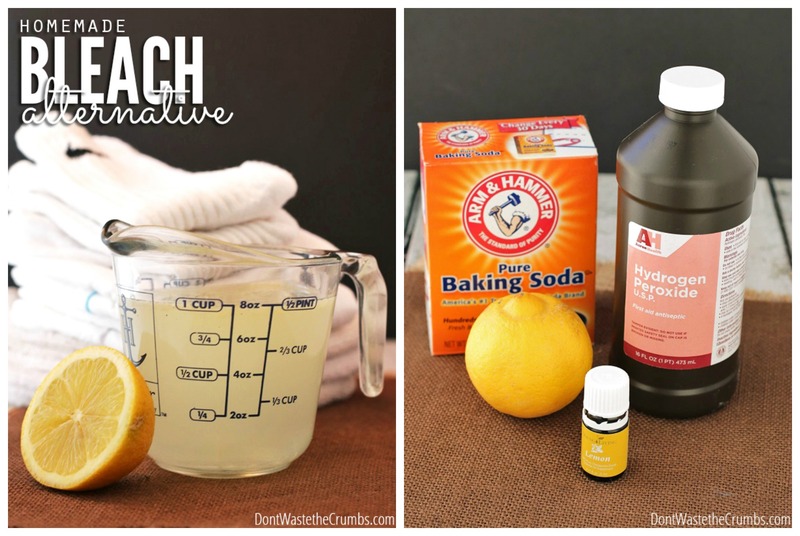 If you are looking for homemade bleach alternatives, hydrogen peroxide is a key player! This recipe will give you a winning combination that brightens your clothes, smells amazing, and won’t irritate your skin. If you like pearly white teeth, but don’t want to pay the money for a professional kit, you can DIY your own! Combine two tablespoons of hydrogen peroxide with one tablespoon of baking soda. Stir it into a smooth non-gritty paste. Dip your toothbrush into the paste and start brushing. Let the paste stay in your mouth for a minute or two before rinsing. This hydrogen peroxide hack helps to clean your teeth, as well as whiten them! It’s a small task to accomplish, but makeup brushes are rarely cleaned as often as they should be! Makeup brushes collect dead skin and bacteria, often leading to break-outs and skin conditions when they’re left dirty. 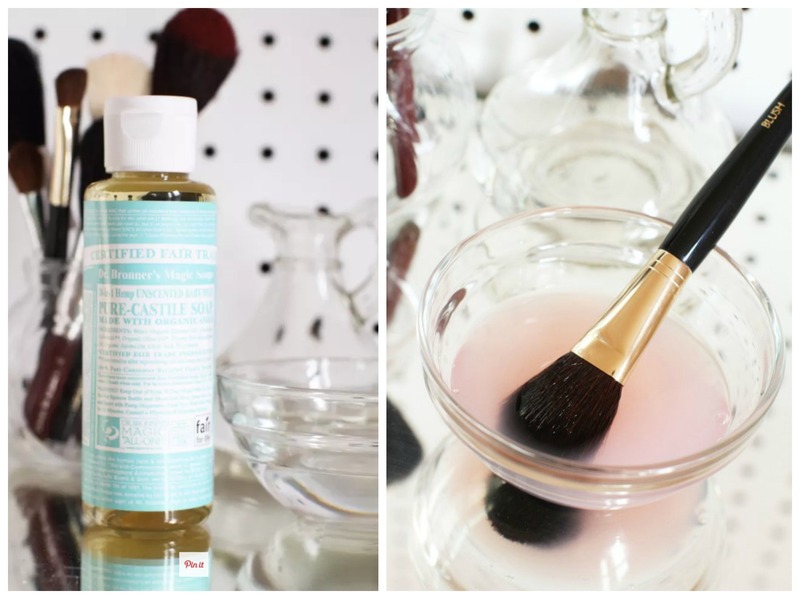 If you’re looking for a quick DIY brush cleaner, this recipe is the perfect one! (Hydrogen peroxide, organic soap or shampoo, and warm water). In this case, hydrogen peroxide is an amazing germ and bacteria killer. Have you ever experienced the disgusting smell of old, musty towels? Your first reaction is to just throw them out and replace them! However, why not throw them in the water with half a cup of hydrogen peroxide and half a cup of vinegar! Then wash them like normal – with detergent, so the vinegar smell doesn’t linger. Voila! You’ve got your clean towels back! Did you know that your hear can get filled with ear wax, sand, bugs, dust, hair, and bacteria? 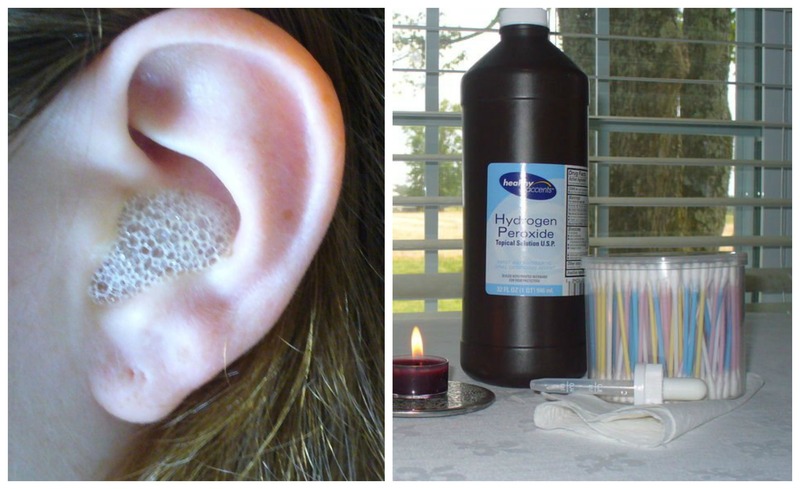 Hydrogen peroxide is a ear-cleaning solution that has been around for a very long time! Get the instructions here. Expect a cold, bubbly sensation. 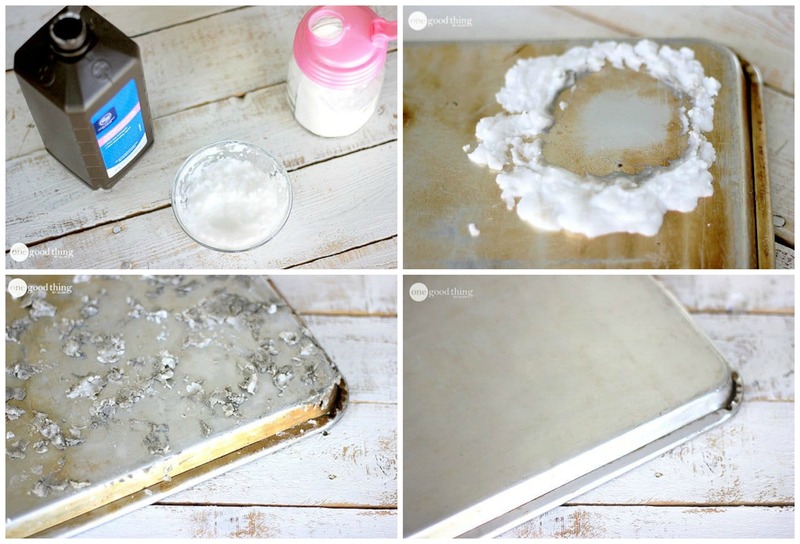 The magic cleaning formula – baking soda and hydrogen peroxide! This cleaning technique takes no scrubbing. You just let the solution soak on the baking sheet and the gunk comes right off! Several years ago, I read an article that informed me that one of the dirtiest places in your kitchen was the dishwashing sponges! Imagine that – the tool that we clean our dishes with is actually filled with harmful bacteria. To make your sponges last longer, soak them in peroxide and warm water. Then rinse thoroughly. This should take out the funky smell and disinfect them. If this technique doesn’t work, it’s time to throw them in the trash! 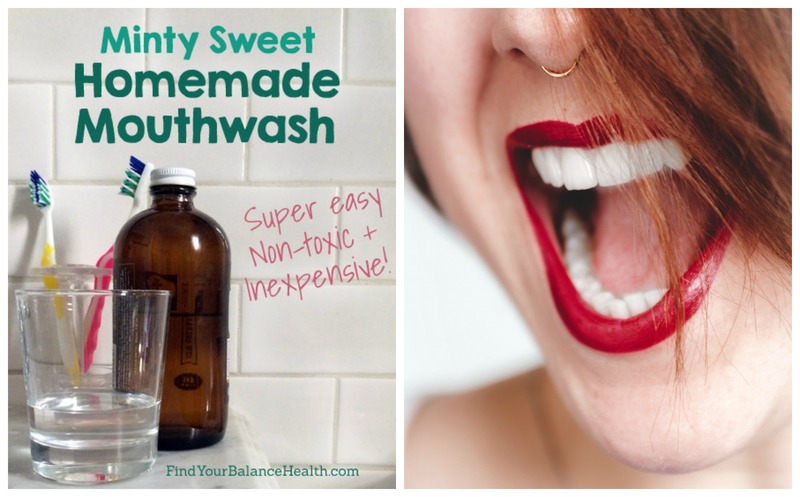 If you’re looking for an easy, DIY, non-toxic mouth wash (that also has teeth whitening benefits), this recipe is for you! The author reminds us that hydrogen peroxide should only be used in small doses because it can be harmful to your teeth if used in excess. However, most bottled natural mouthwashes use hydrogen peroxide in small doses. It helps to whiten and disinfect. Hydrogen peroxide is probably one of the most non-toxic ways to clean your child’s toys! Instead of buying fancy wipes, just spray your kids’ toys with hydrogen peroxide and clean them off with a wet rag. Or, if you are cleaning a bulk amount of toys, fill the bathtub with warm water and hydrogen peroxide and soak all the toys at once. You know that dingy yellow color your nails can sometimes take on? 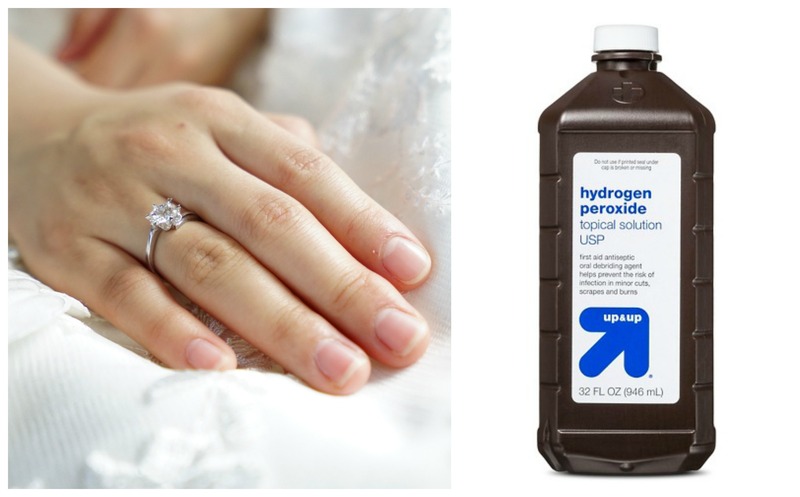 Hydrogen peroxide can help bring back the healthy glow to your nails! Use one part hydrogen peroxide and two part baking soda. This will form a thick paste. Gently massage the paste all over your nail bed and let it sit for two to three minutes. Rinse away the paste and your nails should look more white and clean. Imagine how bacteria-filled your toothbrush is? And yet, every day, you stick it in your mouth without having replaced or cleaned it in weeks! Although you should replace your toothbrush every few months or so, you can clean it with hydrogen peroxide in the meantime. You can also soak mouth guards, retainers, and electric toothbrush ends as well. 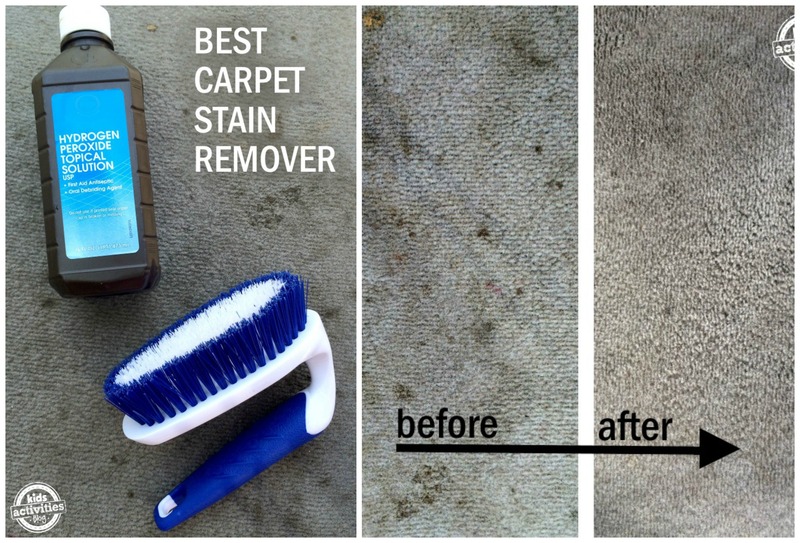 Do you have a dirty carpet in your home or vehicle? This is the magic DIY stain remover! All you’ll need are three ingredients, plus water and some elbow grease! (Water, hydrogen peroide, and some lemon essential oils for smell). Add a drop or two of hydrogen peroxide to your dishwasher or dish soap. Not only will this help to keep your dishes squeaky clean, it will also help your dishwasher not to get that build-up of grime. Hydrogen peroxide is an amazing chemical that can help to keep you and your home clean and toxin-free! The best part is, all the ingredients are easily found in your home. I hope you enjoyed this article! Find more cleaning hacks here.